Japanese Episode AG 025: "Himitsu no Ike! Mizugorou ga Ippai!?" 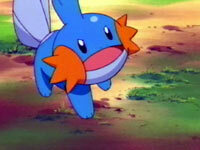 American Episode 297: "A Mudkip Mission"
While searching for a new place to train, Satoshi-tachi encounter a pond full of Mizugorou. Takeshi spots a baby being swept away by a powerful river current, so he uses his Hasuboh to help him rescue it. As his friends congratulate the rescue, the group is approached by Numata-Roujin, an old man who has been commissioned by the Pokemon League to raise Mizugorou for beginning trainers. As the old man tells the kids about what he does, the Rocket-Dan appear, believing that Numata has something of value worth stealing. The old man, who has a bad habit of blurting out secrets at the most inopportune moments, informs Musashi-tachi that if they destroy the dam, the resulting flood would wipe out all the Mizugorou in the area. A pokemon battle ensues, during which Kojirou is flung into the aforementioned dam, causing it to break. As the water sweeps the little pokemon away, Takeshi steps in with his Hasuboh and Forretress to rescue all the Mizugorou. After he gets the mud fish pokemon to safety, he reunites with the rest of his friends. However, the Rocket-Dan appear again to kidnap the pokemon, but their bizarre mecha is quickly defeated. Since Takeshi was so helpful in defending the Mizugorou, Numata-Roujin asks Takeshi to take one of the Mizugorou with him. The young Pokemon Breeder agrees, and now the group is one member larger. Meh, there really isn't too much to say about this episode. It's a fairly standard plot, and the focus on Takeshi makes it painfully obvious that he'll be getting a Mizugorou by the end of the episode (especially since it's been in the opening credits since day one). While the episode had a better-than-average character-of-the-day (Numata, the numa part of his name meaning "swamp"), nicely animated water, and a bizarre Rocket-Dan mecha, the episode still feels like a bad Jouto episode. This is also the episode with the bizarre "Oak molests Cyndaquil" scene in the Oak Pokemon Lecture (he's really just feeling how soft its fur is). The dub for this episode is odd because it's the second episode not to have tons of little time cuts. I guess they got enough of the five-seven seconds they usually cut from each episode out of the commercial break cut that they didn't need to do a bunch of smaller time cuts. The commercial break falls in the same place in the dub as it does in the Japanese version, but there's some footage repeated in the Japanese version that is cut from the dub. It's just repeated footage of Brock looking at the water gushing in with the Mudkip, so you're not missing anything important. One second is cut from the TO BE CONTINUED... screen.